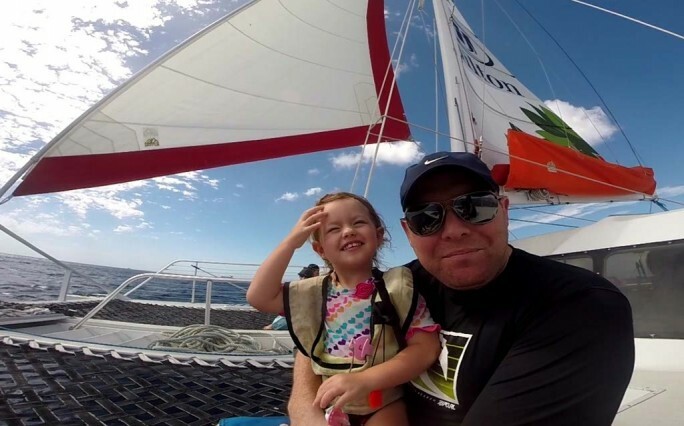 Traveling with a toddler doesn’t have to be stressful. 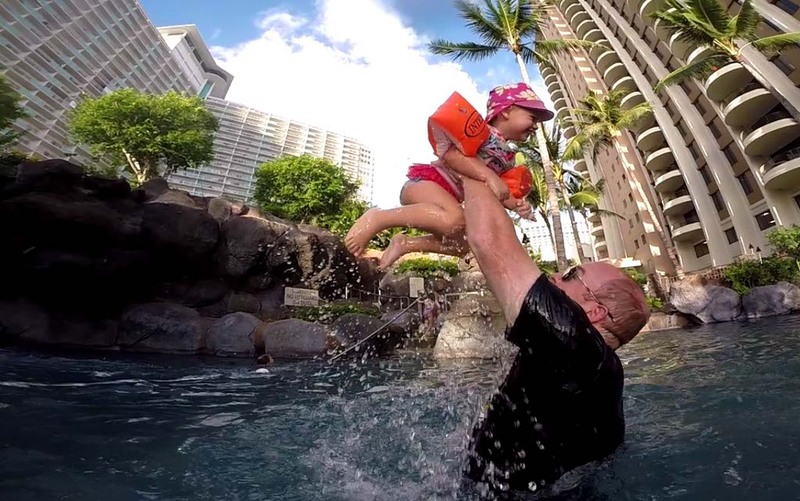 Hilton Hawaiian Village has the perfect surroundings that will inspire you to create precious family moments together. In just two short days, we’ve already connected more as a family and shared unique experiences that will last a lifetime. 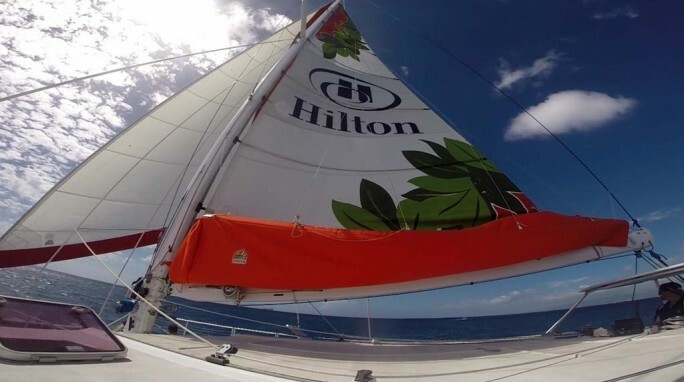 Here are our top five family-friendly activities at Hilton Hawaiian Village. 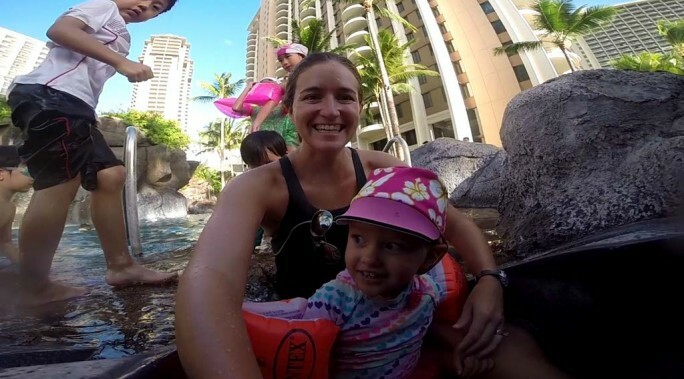 With five pools to choose from, there is definitely something for the whole family but Paradise Pool is where it’s at for kids and kids at heart. The 5,000 square foot family activity pool boasts the longest slide in Waikiki and overlooks the Duke Kahanmoku Lagoon. This pool allows arm band floats for children who don’t meet the height restrictions of the water slide rules so even if your child can’t swim but still wants to go down the slide, the option is there. Athena hasn’t braved the largest slide yet, but she loves the smaller, more toddler-friendly slide. 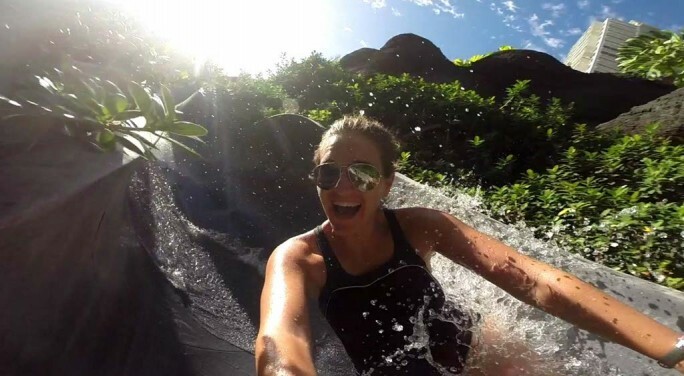 We took turns between the large and small slides to make sure everyone in the family was having fun. 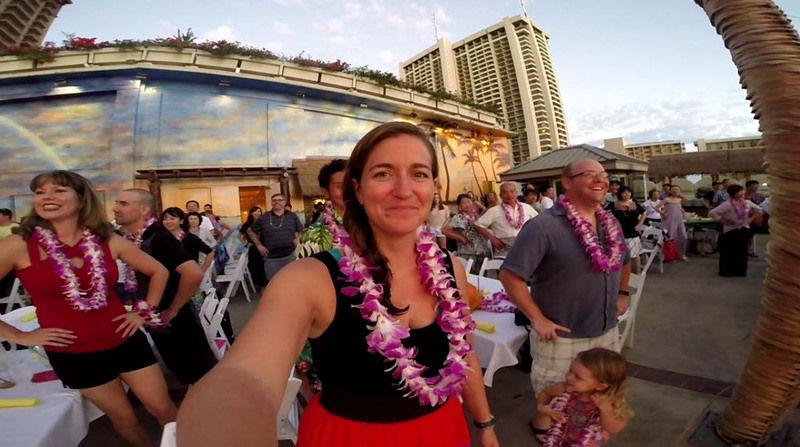 Waikiki’s only outdoor Luau features extravagant Lei greetings, Hula kahiko performers, acrobatic fire dancers and authentic Hawaiian dining in a memorable setting beneath the starlit, mid-Pacific skies. You’d think this experience would be more focused on adults, but it was Athena’s favorite activity so far and that including the water sports. 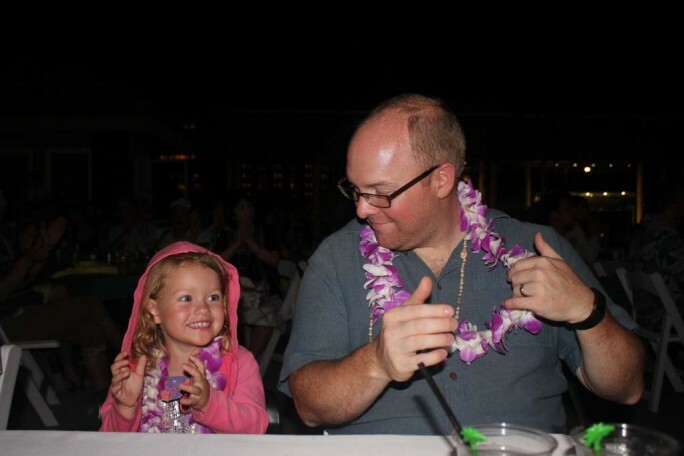 She was mesmerized by the dancers, loved the children’s buffet, practiced her hula skills and clapped along every second of the event. Rather than falling asleep like we expected, she was wide-eyed the entire performance and chatted about what she saw well into the night. Fun-filled family activities await in Duke Lahanamoku Lagoon, a spectacular five-acre salt-water lagoon featuring a state-of-the-art water circulation system. Aqua bikes, kayaks, paddle boards, floats and peddle boats dotted the lagoon along with swimmers and snorkelers. 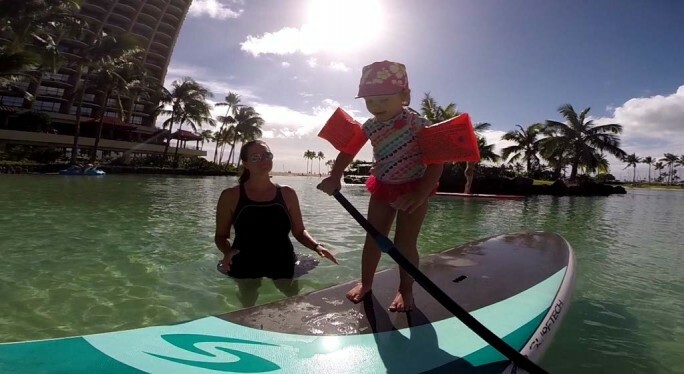 We expected Athena to love the aqua bike, and she did, but what really surprised us was how much fun she had on the paddle board. Gracefully, she stood up and walked around like a pro. She was ready to paddle herself and might have been able to manage on her own if the paddle wasn’t five times the length of her body. Regardless, she tried. As a family, we all enjoyed the kayak and splashed around until our hands were too pruney to hold the paddles. 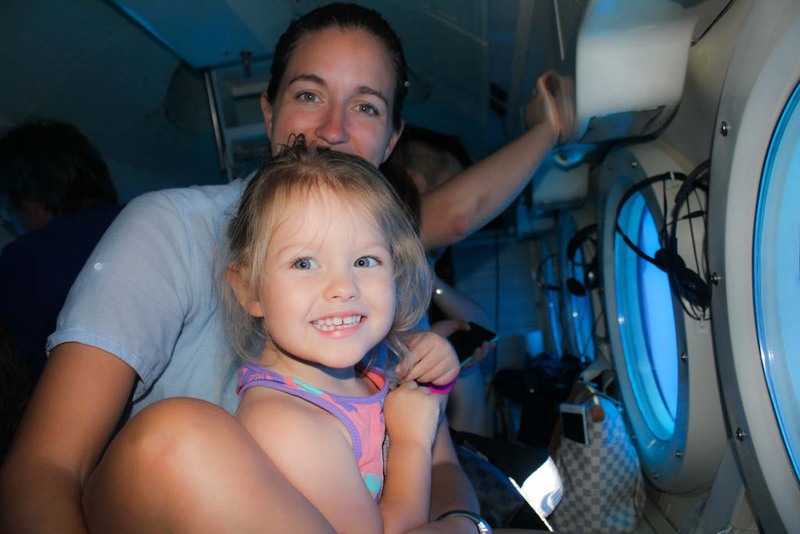 We climbed aboard the Atlantis XIV, the world’s largest hi-tech passenger submarine. Descending beyond 100 feet underwater, we experienced marine life up close. Sunken ships, airplanes and other artificial reefs were on the bottom waiting to be discovered. Athena stood with her face next to the glass for the entire ride. She was in complete awe and excitedly pointed at her findings like she was the discoverer of a new world. We were giving her a lesson far beyond the classroom. The Waikiki coastline was waiting for us on the Spirit of Aloha tour. This modern 54-foot catamaran took us to a highly populated turtle reef where we snorkeled with turtles and other marine life. 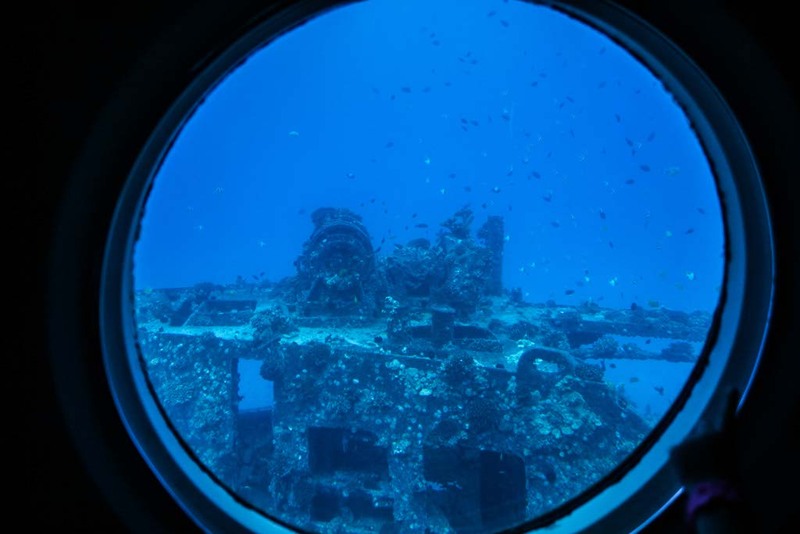 Amenities on board included a full bar, all-you-can-eat lunch, a large fully-enclosed and covered cabin with table and bench seating, two full restrooms, freshwater shower, surround-sound system and multiple stairway entry points for snorkelers entering the water. Although Athena didn’t snorkel with us, we took turns in the water and on the boat with her. For the rest of the cruise, we relaxed on deck as a family. The calming, refreshing waves rocked us gently as we took in the sights and sun. Hilton Hawaiian Village has so much to offer that we haven’t even left the property yet. Tomorrow is another story though as Darren goes scuba diving with Reef Pirates and I swim with sharks with North Shore Shark Adventures. 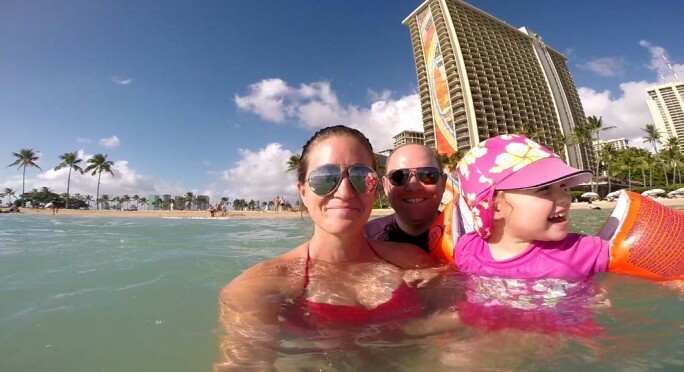 Follow along and see how we manage to include extreme adventures while still keeping an active toddler busy and happy.